If you're a regular reader, you probably already know that I have two little girls. This means that my house, more often than not, is filled with strains of "Let it Go" and "Do You Want to Build a Snowman?" Accurate lyrics and pitch are optional, but spontaneous outbursts of song are not. My eldest just turned six, and with her Frozen obsession in full bloom (frost? ), she wanted a Frozen-themed party. And she wanted to invite the whole class. Since we recently moved to a place where a backyard party was a viable option, I decided to go with it. And cross all fingers and toes that I hadn't just invited twenty tiny hooligans into my house. 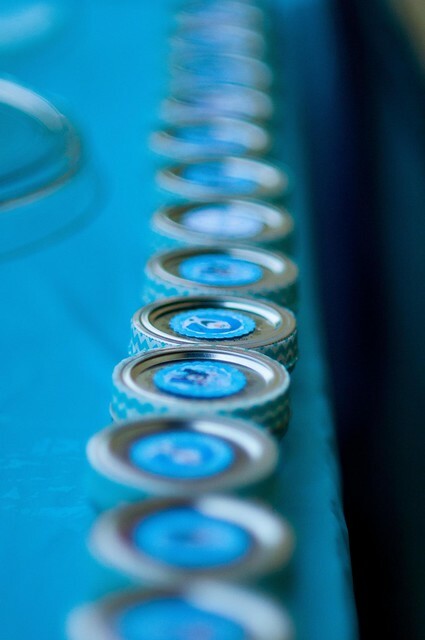 Luck was with me - the day was a little warm (30C), but it was a beautiful day for a party. And while I know this is a food blog, I have to confess that this post isn't *really* about the food. With having an afternoon party, I kept the food simple and sort-of healthy - a rainbow fruit tray (huge hit), a rainbow veggie tray (slightly less of a hit), a cheese and kielbasa tray, crackers, pretzel sticks Olaf arms, tortilla chips and salsa. I don't have a great photo of the set-up, because I put the food out right at the last second, and it was immediately swarmed by small people. We also had a separate bowl of Olaf noses (baby carrots) and some melted snowman punch. Pinterest gave me a lot of ideas for Frozen-themed food, but a lot of them were either really labour intensive (there was no way I was going to fuss with making 20 individual servings of each food), or they were full of blue dye. I try to avoid artificial colours as much as I can, so my only cave to blue dye was a splash of blue gatorade in the melted snowman punch (recipe at the bottom of the post). And the cake icing, but most people don't really eat fondant, so I wasn't too concerned. Back to looking for party ideas on Pinterest. 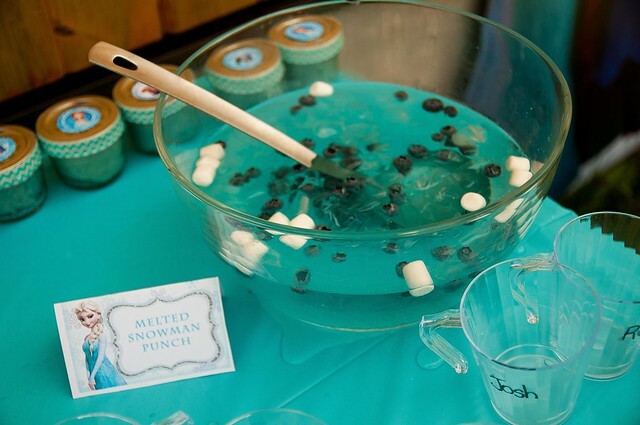 There is definitely NO shortage of Frozen party ideas, and really, none of mine are terribly original. But one common theme that I found when looking through various craft ideas or favour ideas or food ideas is that many of them were either really time consuming, or really expensive. I'm not going to lie, I did spend more than a few hours on this party, but none of the projects on their own were especially complicated/difficult, and none of the components (aside from Elsa and the cake) were particularly expensive. What I'm telling you here is that if you like one of these ideas, you can easily do it and it won't take forever and it won't break the bank. 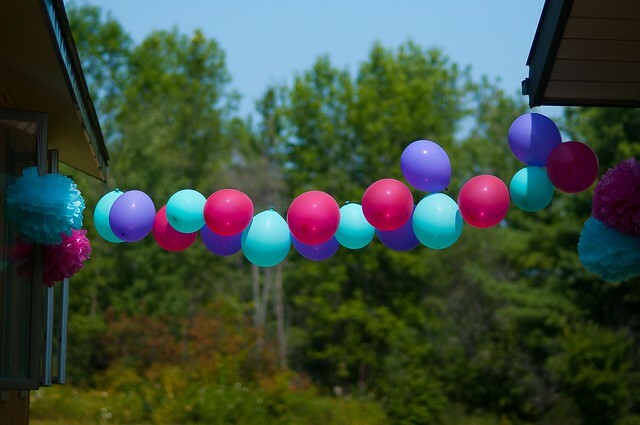 For decor, I primarily used balloons (made a quick garland with fishing twine) and tissue pompoms. These are both cheap, and while the tissue poms can be a bit time-consuming, you can definitely knock off a few during an evening of netflix watching. Funny story about the balloons - as the day got warmer and warmer, they started to self-destruct in the sun. It was pretty funny. I also stuck with inexpensive plastic table cloths, which was great because children spill everything everywhere, and this avoided a lot of clean-up woes. 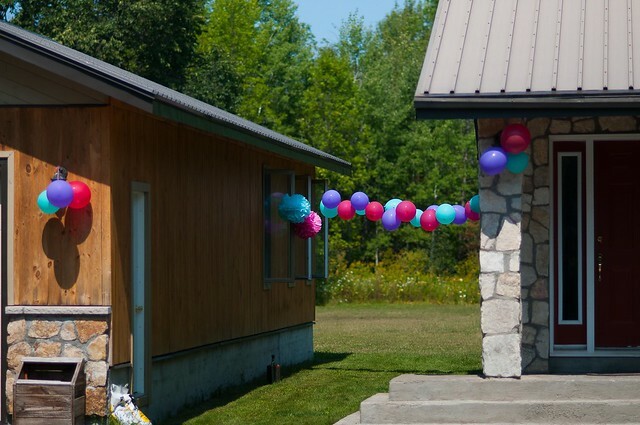 (As an aside, having an outdoor birthday party is the best thing...who cares about all the spilled drinks and all the messy crumbs....I shudder to think what my basement would have looked like after this party, but having it outdoors was GREAT!!!!!!). In terms of the artwork, if I had photoshop skills, I'm sure I could have figured something out on my own. Alas, I have no skills. So I used instant digital downloads from Etsy - they are inexpensive and simple, as long as you have a printer. Plus, I had slave labour in the form of an almost six-year-old so I didn't have to do that much cutting. I got this cute birthday garland. And these adorable food labels. For entertainment/activities, I have to admit that I overthought this a bit and my initial plan had the kids way overscheduled. Thankfully I came to my senses and just let the kids do their thing. 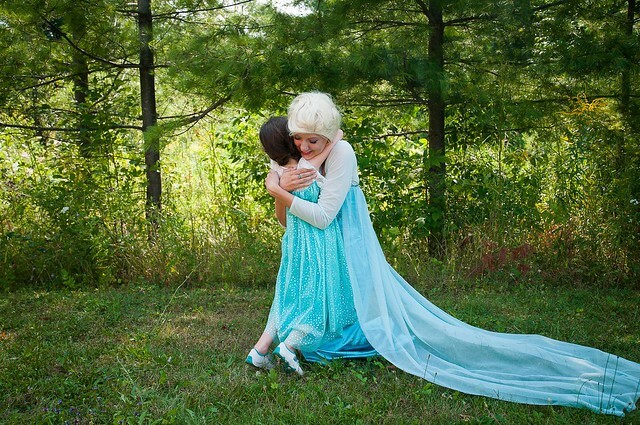 I hired a princess for our party (the Snow Queen, from OfficialPrincessParties) and she was awesome. Most of the kids just loved her, and she kept them very well entertained. I don't have many photos, because I want to respect the privacy of my mini party guests, but rest assured, the kids had a blast. I had planned to do a pin the nose on Olaf game - a family member printed Olaf out for me, and I had my little slave cut out the noses. We didn't get to the game though (kids were having too much fun playing! 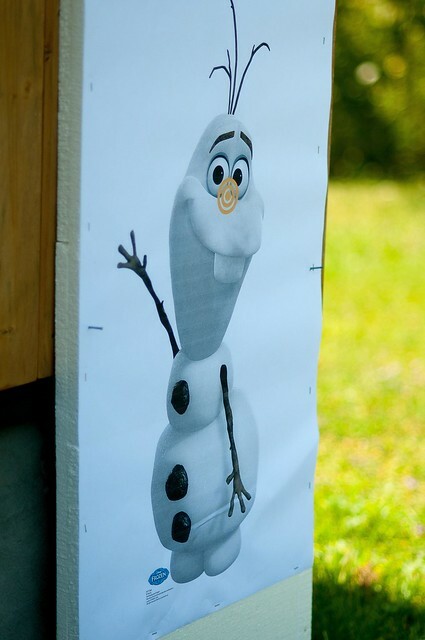 ), so poor Olaf is still noseless. The pinata I decided we HAD to have also went unsmashed. Again, we didn't get to it, because the kids were so engaged with the princess, that by the time she left, it was time for cake! 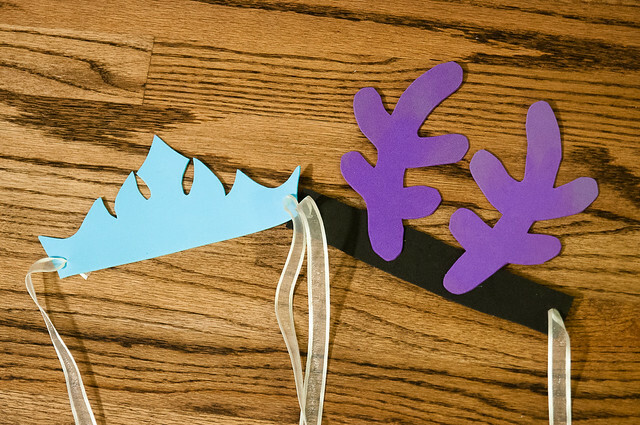 As for what we did do, the kids decorated Elsa crowns or Sven antlers with stickers as they arrived. I found the printables off this great blog, and just picked up some craft foam at dollarama (I used some of the orange foam for the Olaf noses). I had a large spool of ribbon, so I used that to tie the crowns/antlers over the kids' sunhats. The kids also did some "frozen fractal" paintings, which was a great idea I got from this blog. 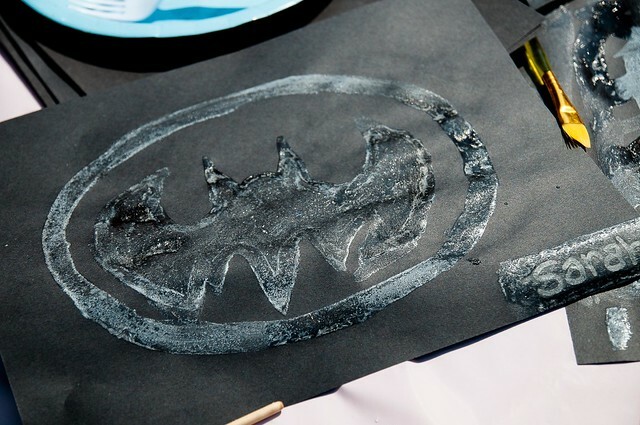 This was awesome because it was SUPER cheap and easy (I already had epsom salts, and then got paint brushes and construction paper from the dollar store) and it was a neat craft. Here's a sample from an older guest (all my other shots have kids in them!). It's neat to watch the salt crystals form from what looks like water at first glance. I think batman would approve. 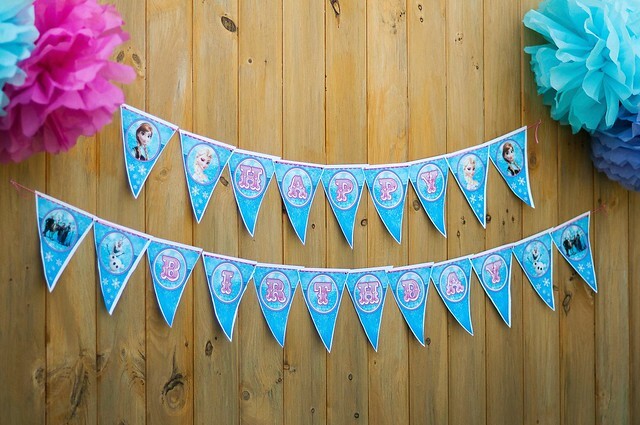 I did get a few licensed products from PartyCity (the Anna/Elsa stand-up, and the table decorations, as well as the pinata, plates and napkins). You can probably find these things at any party store! I came across this beautiful cake idea on Pinterest, and as soon as I saw it, I knew it would be perfect for the party. I liked the idea of a fondant cake on a hot day (to avoid melted icing) and I thought the little figurines were really cute on top of it. I got the cake from Cakeadoodledoo and she did an awesome job, and saved me a lot of work. I feel like this type of cake could probably DIY-able for someone with fondant skills, but I don't have those skills, and I always find cake is stressful, because you can't do it up in advance AND it makes a big mess in the kitchen. I had a 6" white cake on top and a 10" chocolate cake on the bottom and it was deeeeelicious. And so cute, right? For favours, I wanted to keep things simple. We had a no-gifts party, and I didn't want to send kids home with an armload of plastic trinkets (i.e., exactly what we wanted to avoid with the no-gifts party! 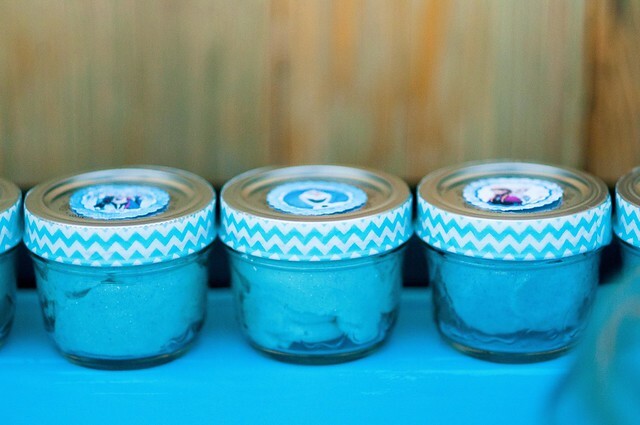 ), and when I came across this recipe for glitter playdough, I thought it would be perfect. It came together really well, and Z was able to help me make it. I used a combination of blue liquid and gel food colouring (didn't have to add any yellow, surprisingly), and I bought glitter caddies from the dollar store and used blue and silver glitter in it. I found the chevron tape at Staples, and then the cute little labels on top were from Etsy, and I just shrunk them a bit and cut them with a scalloped round punch I already had. I made two quadruple batches of the dough and it easily filled 24 1/2 cup mason jars. The dough is super soft and my kids have really enjoyed playing with it. I hope the ideas help those of you who might be planning Frozen parties for your Frozen-obsessed kids. My bottom line advice would be not to overplan the activities (just let them play - we have a playstructure/sand box and that was the biggest draw of the party!). And write their names on their cups. Just trust me on that one. I LOVE it!!!!! Miss your blog posts. I have 2 daughters as well and my oldest is turning 5 in Jan ... it will be her first official 'party' and I was going to do a Frozen theme. Thanks for all the awesome ideas!!!!!! 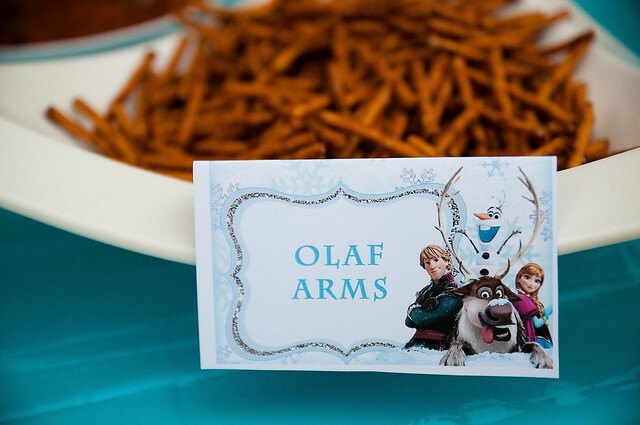 What an adorable Frozen themed party! 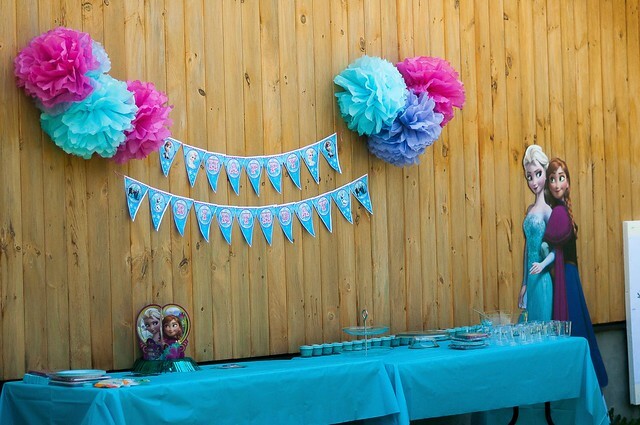 I feel frozen themed parties are getting popular these days. 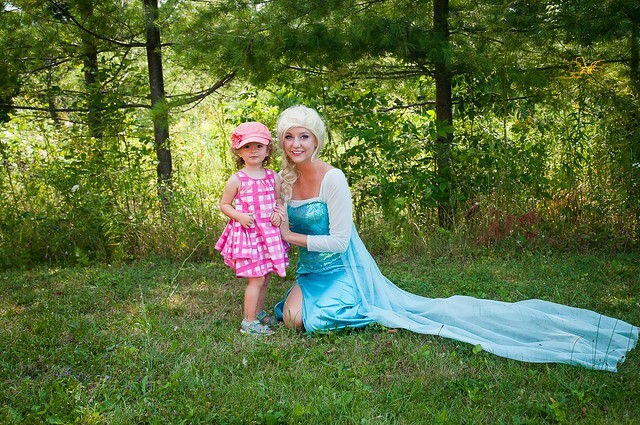 Especially the kids love to attend frozen themed parties. 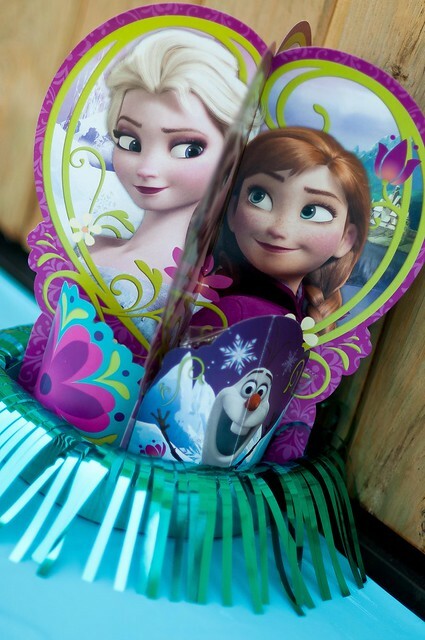 Well dear I am looking for some more frozen themed summer party ideas. If you have then please share for me!! Awesome!! 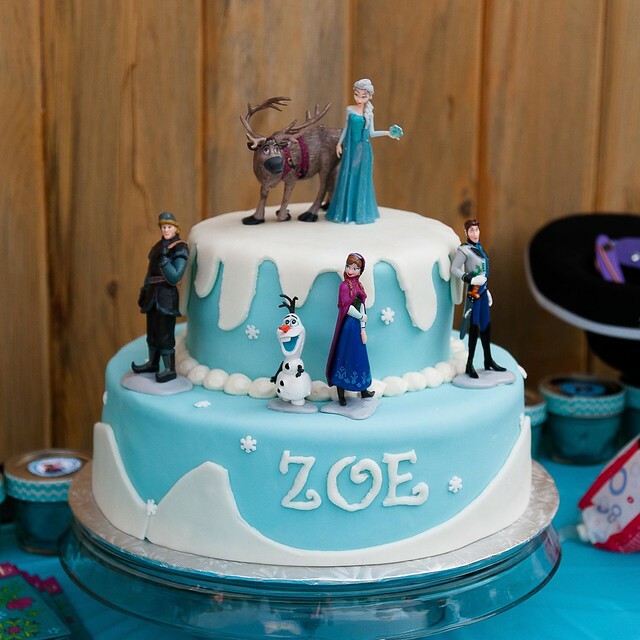 Great photos of an outdoor Frozen birthday party. I showed my daughter... now she wants one. Wow! That was a great effort out there to put up this wonderful birthday party. I really loved your idea. 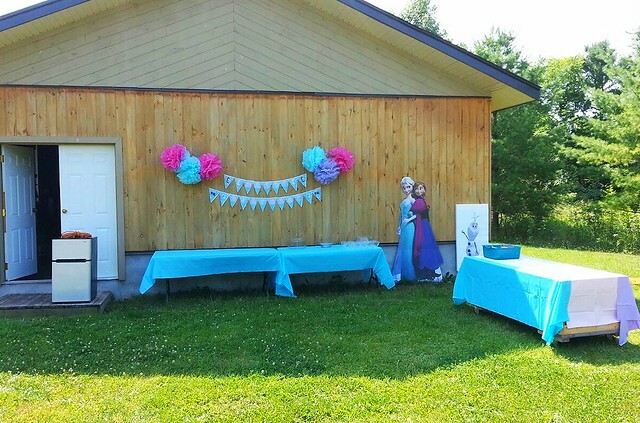 I also found frozen themed birthday party here.